Home epic epic games fortnite games tech technology twitch prime twitch prime loot Twitch Prime subscribers can grab all new exclusive Fortnite loot for free. Twitch Prime subscribers can grab all new exclusive Fortnite loot for free. Battle Royale Trailblazer Outfit : "On the forefront of victory". Battle Royale Tenderizer Pickaxe : "Find your way". Battle Royale Tenderizer Pickaxe : "Leave a good first impression". Battle Royale Freestylin’ Emote : that will let you "Tear up the dance floor". 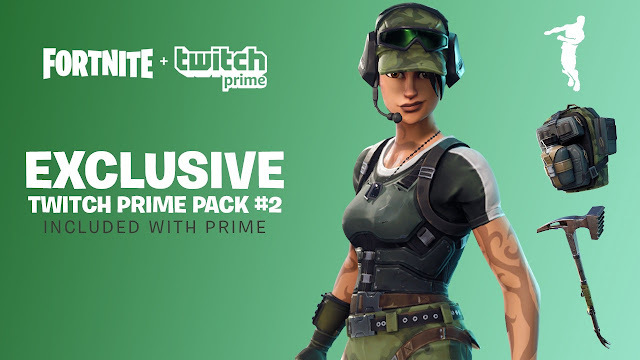 This exclusive loot will be free as a benefit for all Twitch Prime subscribers. How can you claim this reward? To claim the reward, you will need to be a Twitch Prime subscriber. If you are not a Twitch Prime subscriber you can check the Twitch Prime subscriber detail on their website link: Twitch Prime subscriber. If you are already Twitch Prime subscriber just signin to your account just click here and click the link inside the blog post to claim your loot pack. Once you have claimed your loot pack, load up Fortnite and your loot will be available to you!